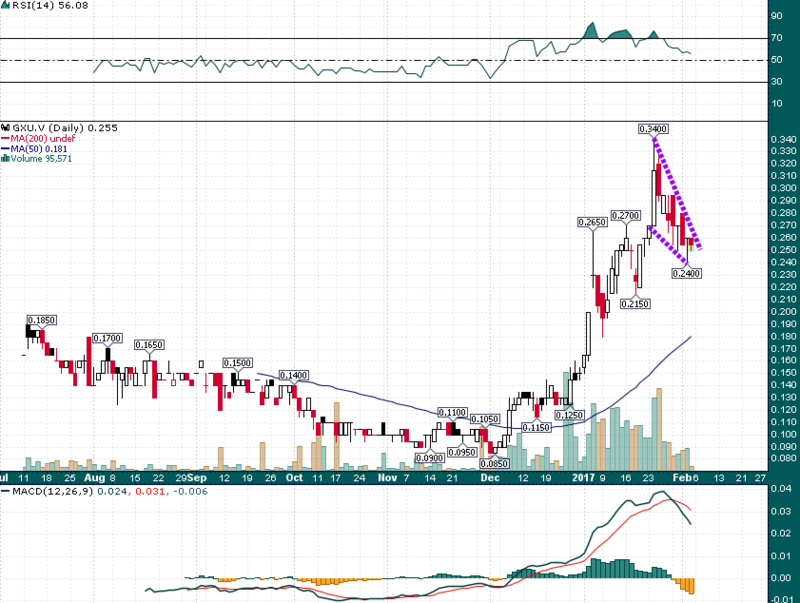 Stock Snapshot: GoviEx Uranium | Energy and Gold Ltd. Since peaking at C$.34 in late January GXU has pulled back along with the uranium sector, forming a bullish falling wedge pattern on light volume – support near C$.22-C$.24 is key while a rally above C$.27 would target at least a retest of the C$.34 high. Energy & Gold: What can you tell us about the uranium sector in the last couple of months? Have you noticed anything different since we have seen the stocks take off in December? Daniel Major: I think the key thing about this rally is that it has been backed by a number of key changes. We all recognize that the long term supply demand gap will become a major issue unless there is an upward movement in the uranium price, as projects cannot get developed to fill the gap. The sector was struggling with short term issues – and the recent announcements have helped to alleviate those – the key change obviously being the Kazakh production cut reducing the supply of spot material. In addition, production from Cameco, Paladin and ERA are also lower. ConverDyn announced a large capacity cut which should reduce the amount of under feed material coming to the market, and Trump statements seem to be positive for nuclear energy. Energy & Gold: Any updates on Madaouela and what news can investors expect from GoviEx over the coming months? Daniel Major: Our focus will be on optimizing Madaouela – starting drilling of Miriam expansion – to make the first 10-12 years of production Open Pit only – thus simplifying the proposal to the financing community and off takers. We are also looking to get a grip on economics studies at Mutanga (GoviEx’s Zambian uranium project). Energy & Gold: What is your take on the Cameco/Tepco news (long term contract dispute)? Daniel Major: For the industry i do not see this being an issue – it is mainly a Cameco problem – on the whole though it does lock up material which Tepco can not put back to the market. We look forward to watching GoviEx’s progress at its African uranium projects in 2017 as GXU rapidly closes in on becoming the next major global uranium producer. The article is for informational purposes only and is neither a solicitation for the purchase of securities nor an offer of securities. Readers of the article are expressly cautioned to seek the advice of a registered investment advisor and other professional advisors, as applicable, regarding the appropriateness of investing in any securities or any investment strategies, including those discussed above. GoviEx Uranium (TSX-V:GXU) is a high-risk venture stock and not suitable for most investors.. Consult GoviEx Uranium’s SEDAR profile for important risk disclosures. EnergyandGold has been paid to cover GoviEx Uranium and so some information may be biased. EnergyandGold.com, EnergyandGold Publishing LTD, its writers and principals are not registered investment advisors and advice you to do your own due diligence with a licensed investment advisor prior to making any investment decisions. This article contains certain forward-looking information and forward-looking statements within the meaning of applicable securities legislation (collectively “forward-looking statements”). Certain information contained herein constitutes “forward-looking information” under Canadian securities legislation. Generally, forward-looking information can be identified by the use of forward-looking terminology such as “expects”, “believes”, “aims to”, “plans to” or “intends to” or variations of such words and phrases or statements that certain actions, events or results “will” occur. Forward-looking statements are based on the opinions and estimates of management as of the date such statements are made and they are subject to known and unknown risks, uncertainties and other factors that may cause the actual results, level of activity, performance or achievements of the Company to be materially different from those expressed by such forward-looking statements or forward-looking information, standard transaction risks; impact of the transaction on the parties; and risks relating to financings; regulatory approvals; foreign country operations and volatile share prices. Although management of the Company has attempted to identify important factors that could cause actual results to differ materially from those contained in forward-looking statements or forward-looking information, there may be other factors that cause results not to be as anticipated, estimated or intended. There can be no assurance that such statements will prove to be accurate, as actual results and future events could differ materially from those anticipated in such statements. Actual results may differ materially from those currently anticipated in such statements. The views expressed in this publication and on the EnergyandGold website do not necessarily reflect the views of Energy and Gold Publishing LTD, publisher of EnergyandGold.com.Accordingly, readers should not place undue reliance on forward-looking statements and forward looking information. The Company does not undertake to update any forward-looking statements or forward-looking information that are incorporated by reference herein, except as required by applicable securities laws. Always thoroughly do your own due diligence and talk to a licensed investment adviser prior to making any investment decisions. Junior resource companies can easily lose 100% of their value so read company profiles onwww.SEDAR.com for important risk disclosures. It’s your money and your responsibility.